Armed with your knightly honor and the Red Checkered LARP shield, bravely defend yourself from enemys blows during your next LARP skirmish. 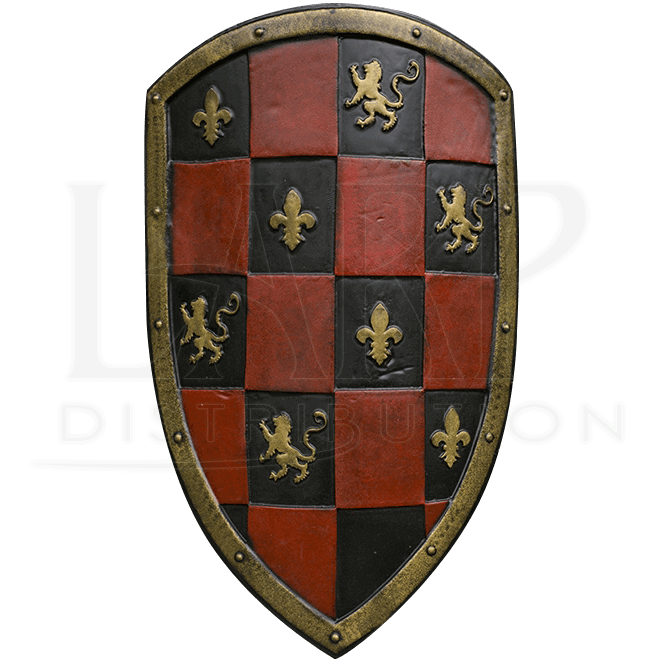 This slightly curved, kite shaped shield features a red and black medieval heraldry look. Made from hard EVA foam and coated with latex, this historic-inspired LARP shield has been handcrafted for a realistic appearance, with its red and black checkered pattern decorated with laser-cut golden colored rampant lions and fleur-de-lis details as well as a metallic-looking rim. Due to its handmade nature, there may be slight natural variations in the appearance of this LARP defense. Three buckled straps on the back help firmly attach the Red Checkered LARP Shield to either your right or left arm, making this shield a versatile addition to live action reenactment arsenals. This LARP shield is approximately 31.5 Inches in overall length. This measurement will vary as each LARP item is handmade.